Marketing with Custom Promo Lanyards | TJM Promos, Inc.
It’s easy to be wowed by all the high tech promotional products available today. We live in a golden age of devices, and they certainly have a place. But sometimes it’s best to get back to basics. That’s where we can help with custom promo lanyards. “You can’t be serious,” we hear you say. “Lanyards? Those are so last century!” In fact, we are quite serious. 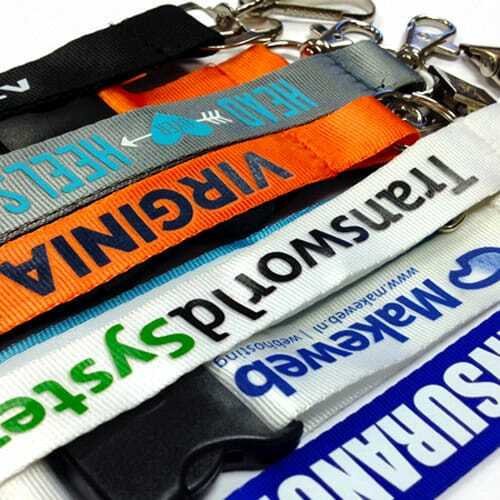 Custom lanyards are a timeless way to promote your brand or logo. They work great in high-volume environments, and they’re quite economical. What’s not to love? It’s no secret that lanyards are an excellent way to keep I.D. badges close at hand in a way that makes them hard to lose. That’s a big part of what makes them popular for school and office I.D. cards. And if you order them imprinted with your school mascot or company logo, they serve as a low-key marketing tool within that environment. Now consider expanding the reach of your custom lanyards. In a typical office or retail environment, lanyards do work as a marketing tool, but the audience is relatively limited. At conferences and trade shows, lanyards serve as mobile billboards for your brand! You know what it’s like at conventions, trade shows and conferences. All too often, the I.D. badges for the event have either pin-on badge holders or clip-ons. The pin-ons make holes in clothing, while the clip-ons are inconvenient and easy to lose. Many people prefer a more convenient, less damaging alternative. That’s where custom promo lanyards enter the picture. If you’re giving away lanyards at your booth, people will flock to it as a better way to wear their I.D. badge. That gives you a chance to showcase your product or service to more people. The more people you give lanyards to, the more visible your logo will be in the conference. That will have the effect of sending even more people to your booth or display. It’s an ever-growing circle of potential customers! Of course, when you order from TJM, you get all the advantages we’re well-known for. We give you the lowest prices, the highest quality merchandise and the finest customer service in the industry. So what are you waiting for? Order custom promo lanyards for your organization today, and be ready for that next trade show, conference or convention. You can call us toll free at 800-423-0449, email us at [email protected] or fill out our no-obligation Free Quote form to find out more! This entry was posted in Posts and tagged promo lanyards.